After a full season on Hulu, Marvel’s Runaways are finally living up to their name. Next month, Hulu is debuting Runaways season 2, which will continue the adaptation of Brian K. Vaughan and Adrian Alphona’s classic comic book. 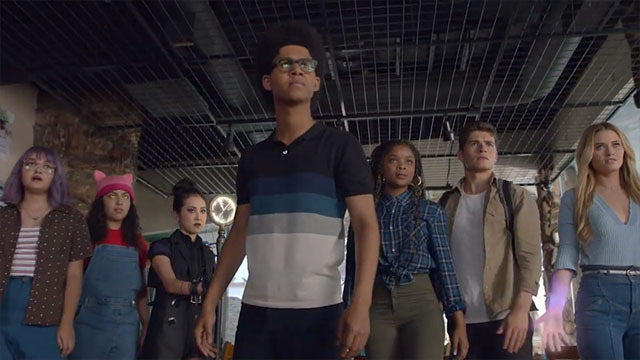 Alex Wilder (Rhenzy Feliz), Nico Minoru (Lyrica Okano), Karolina Dean (Virginia Gardner), Chase Stein (Gregg Sulkin), Gert Yorkes (Ariela Barer), and Molly Hernandez (Allegra Acosta) want to stop their evil parents, the Pride. Thanks to their parents, the kids have already been framed for murder. And there may even be a traitor among them. Via Entertainment Weekly, the new trailer for Runaways season 2 has arrived. It also features the debut of Jan Luis Castellanos as Topher, another character from the comics. “He’s not all that he appears to be,” teased executive producer Josh Schwartz. EW also had a teaser image the Hostel, the Runaways’ new hideout. Stephanie Savage, one of the executive producers, also shared some background on the new location. Runaways season 2 will premiere on December 21. Check out the trailer, and then let us know what you think about it in the comment section below!